Photo: The mural features a cascading waterfall, which is a metaphor for education and knowledge. At the bottom of the mural are two kids with plants springing from their heads to represent how their minds grow. 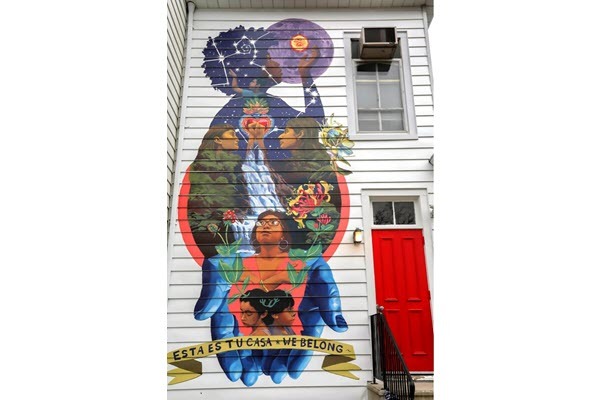 In the next few weeks, the Rutgers Center for Latino Arts and Culture (RUCLAC) is set to unveil a mural headed by muralist Layqa Nuna Yawar and painted by Rutgers students and postgrads on the exterior of their College Avenue building. To design the mural, Yawar set up workshops where he invited students and postgrads to share what they wanted to see and who they wanted to represent in the piece.